Flyball is a relay race between two teams of four dogs. 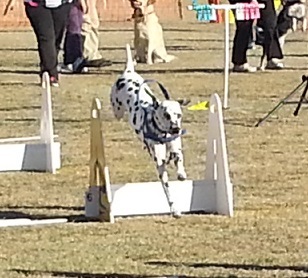 Each dog runs as fast as they can over four low jumps, and grabs a ball from a specially designed flyball box. As soon as they have the ball, they race back over the four jumps to their handler, so that the next dog in the team can start their run. The fastest teams in the country can complete a full run (four dogs) in less than 18 seconds. Can my dog do flyball? 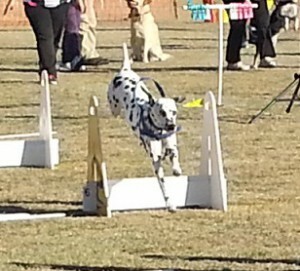 Dogs of all breeds and sizes can play Flyball. Jump heights are set by the smallest dog on the team, so small dogs like Jack Russells, Poodles, Cavaliers etc. are highly valued members of the team. We also like the super-fast, ball mad dogs like border collies and kelpies – and flyball is a great way for them to burn off excess energy. Dogs must be 12 months old to start training in Flyball at TDTC. Dogs must also have passed the beginners level obedience (or equivalent) before they can start Flyball. Why should my dog do flyball? Flyball is all about running around and chasing balls – two things which most dogs love. It is an activity that you and your dog can enjoy together. 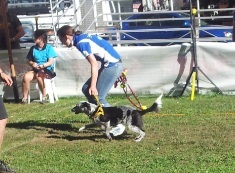 You can also go to competitions all around Australia and meet other Flyball handlers. When are flyball classes held? Flyball classes are on Monday nights. Times may vary depending on the time of year, so speak to the Flyball Co-ordinator for start times. Existing members – If you would like to join a Flyball class then please speak to your instructor or session manager, who will add your name and contact details to the Flyball waiting list. Alternatively you can contact the club. For more information about Flyball you can also visit the website of the Australian Flyball Association at www.flyball.org.au.